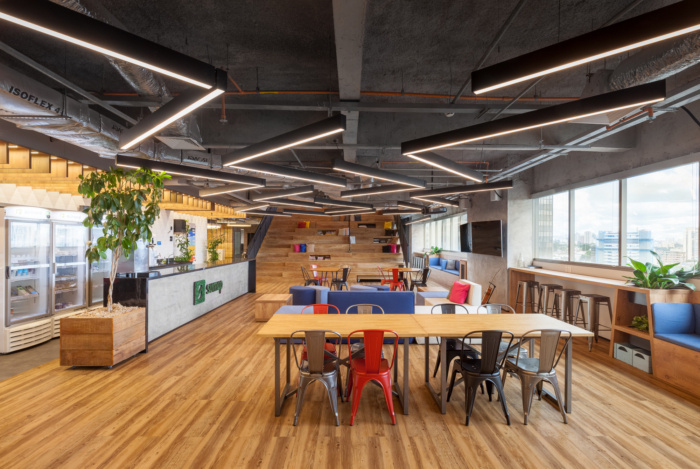 Leonetti Piemonte Arquitetura designed the offices for credit card processing company, SumUp, located in São Paulo, Brazil. How to create a corporate environment in which work, cooperation, collaboration, focus, rest and creativity coexist side by side, pushing each other forward without disturbing each other, while being encompassed by an environment full of identity, modernity and joviality? This was the challenge launched by SumUp, a leading company in the fintech industry, known for its presence in the market of credit and debit card machines. In 2016, LPA faced this challenge, reinventing the company’s corporate identity and coordinating its transition to the new space. The office designed by LPA develops around one of the main values of SumUp: practicality. The variety of spaces designed allows for different forms of work and coexistence. From phone booths, meeting rooms and focused workspaces to various cafes, whiteboards, brainstorming and collaboration spaces, the resulting office is with no doubt a multiple and adaptable space. With so many different spaces, one of them deserves more attention: the Town Hall. This mix of canteen, cafe, auditorium, bleachers and informal meeting is the heart of SumUp, reflecting its way of working. This area is used daily by the staff, and once a week, all teams meet in this space to share their achievements, challenges and results.